Graven Games takes a look at Anvil Industry's Republic Goliath Assault Mech in this new review article. We love to use big stompy war robots in our games, and today we are adding the Republic Goliath Assault Mech from Anvil Industry to our collection. 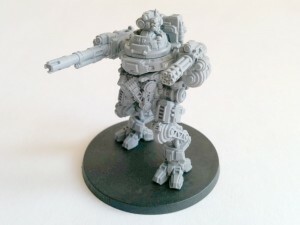 The Goliath Assault Mech is part of Anvil Industry’s AFTERLIFE miniatures range, a tabletop wargame which was successfully kickstarted at the end of last year. Anvil Industry also produce an extensive range of power armoured minis as part of their Exo-Lords range, in addition to a wealth of conversion parts suitable for use in 28mm wargames such as Warhammer 40k.